Are you struggling to step into your purpose in life? I have been there and it can be a battle in the event that you've also been struggling with low self-esteem. A lot of people hit snooze in their purpose because they do not think they have what it takes to create an impact... but they are wrong. We are all capable of stepping into with clarity and confidence to our purpose. 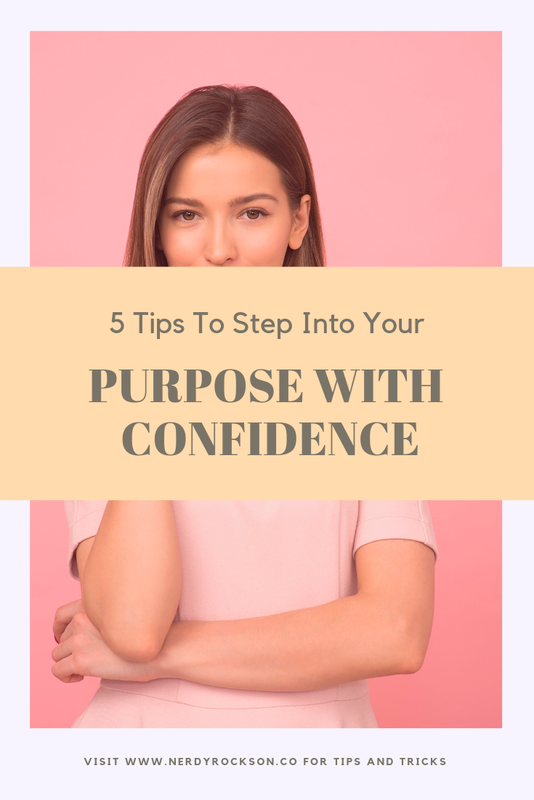 In this post, I'm giving you my hints so that you may step with confidence into your purpose, impact the lives of countless and produce an wonderful legacy. God created us to not blend in with the world but to fully change the game. Stepping to your purpose with confidence requires you to adopt the mindset of success. We're taught that whatever mindset which you have, whether it's one of failure or success and growth, that's the kind of person that you will end up. It might sound weird to discuss success and purpose in precisely the exact same sentence. Nonetheless, it's really a significant part of the process. The bible claims that many are called but few are chosen. I didn't really understand exactly what that verse meant until a friend of mine broke it down for me (Matthew 22:1-14). When we're born, God provides every one of us with gifts, talents and everything else we need to live the type of life and create the size of effect we're meant to. Though many of us are called, because we do not feel that we will succeed in fulfilling this purpose, we say no. THOSE CHOSEN ARE THE ONES WHO SAY YES BECAUSE THEY HAVE PROGRAMMED THEIR MINDS FOR SUCCESS AND WILL ACCEPT NOTHING LESS. A person fully living out God's plan for their life is a person with the mindset of a successful person. I've come to learn along my journey that I will never get further than where I am right now if I can't see myself as more than what I can see with my eyes. Every successful person starts with two powerful beliefs (or mindsets): the future can be better than the present and that they have the power to do so. The difference between can and cannot are three simple letters. Three letters that determine your life's direction. People live a remarkable, purpose-driven life because they have mastered the skills and gifts they need to be successful. The same goes for you. Stepping into your purpose, which will inevitably change your life, can be such a scary, overwhelming experience. But knowing what your strengths are and how to use them makes the transition that much easier. When I was starting making the shift from being a Teacher of English to becoming a Spiritual Teacher, Speaker and Coach, it was an intimidating process because everyone else in my field seemed to be more accomplished than I was with tons of capital for a start-up. Though the odds were seemingly stacked against me I understood that I was an excellent writer with the potential to write my way out of any situation so I leveraged that to the best of my abilities to gain some more traffic to my website. I also used my creative skills to design challenges, ebooks, workbooks and printables that would attract potential clients to my website who would then opt into my mailing list. GOD’S PLAN CAN BE DAUNTING FOR MANY BECAUSE WE FOCUS ON OUR LIMITATIONS INSTEAD OF FIGURING OUT HOW TO BECOME BETTER AT WHAT WE’RE ALREADY GOOD AT. Do you think Jim Kwik became the memory expert he is today by wasting time and energy on hiding his flaws? No, he didn’t. He knew that his brain was his biggest asset so he spent hours each day learning how to use every inch of. He could then go out into the world and change the lives of everyone he met. You cannot live a life of maximum purpose and impact if you don’t spend time becoming an expert in your field of practice. If your focus is on art, practice your technique until you can do it with your eyes closed and hands tied behind your back. Stepping into your purpose with confidence involves developing your strengths, not eliminating your weaknesses. Those who pursue their purpose with clarity and confidence know how to squash automatic negative thoughts when they enter the mind. Automatic negative thoughts can only serve to destroy you and your purpose. They are those tiny (or incredibly loud) voices that tell you that you aren’t good enough, and tell you that you’ll never be great. Cancelling automatic negative thoughts means replacing them with thoughts that are pure and uplifting. It means reminding ourselves every minute of every day just how amazing we are, how powerful we have the potential to be, and that God is preparing to use me and you in mighty ways. When you squash the negative thoughts before they even pop into your head, you empower yourself to move forward. You become more confident, more driven and you almost instantly start seeing positive results. POSITIVE THOUGHTS LEAD TO POSITIVE ACTIONS WHICH CAN ONLY HAVE POSITIVE OUTCOMES. The greatest weapon you have in your arsenal is the ability to choose what you think and do. Choose to think positively when a new situation you are unfamiliar with comes your way. If God tells you to head to South Africa and preach to the locals, don’t immediately think about everything that could possibly go wrong. Focus on all the amazing things that could happen instead– you’ll be going to a new country, trying new food and able to connect to people for whom you might be their one and only encounter with God. That’s a powerful opportunity and a blessing. The kingdom of God is waiting for people, just like you, who are willing to let go of the negative thoughts holding them back so they can step into their purpose with confidence. Self-affirmations and visualization exercises work wonders for me. If I’m placed in a new situation and it seems scary, I spend my time imagining what the experience could look like. I think about the people I’m going to meet, the connections I’ll be making and I reassure myself in the mirror that I’m going to rock this. It works every single time! If you realized just how powerful your thoughts were, you would never think a negative thought ever again. You are meant for more. Every day when you wake up, you need to keep these precious words at the forefront of your mind. Just knowing that you are meant for more isn’t always enough. Find ways to motivate yourself so you can go out there and take action. I’ve come across tons of men and women of God who have an amazing purpose laying dormant inside them. They live out their days, go through the years and never fulfil that purpose because they’re waiting on outside sources to light a fire under their hiney. That isn’t how this whole purpose-driven life works because the phrase itself implies that we need to be “driven”. But how do you become a “purpose-driven person”? You push yourself every day because no one else is going to do it. No one has the obligation to help you step into your purpose. This is a decision only you can make. YOUR GOD-GIVEN PURPOSE HAS TO BECOME A PRIORITY IN YOUR LIFE. That is the only way you can truly motivate yourself to live it. One of my dreams is to write three books that will become international best-sellers in bookstores, on Amazon, you name it. Every day I remind myself that a big part of living a life of purpose and intention is writing those books and getting them published. Because this is a priority I try my best to get one step closer to that goal every morning when I wake up. When the going gets tough, I sit down and imagine myself hosting and signing books at my very own book launch. I see the colours, the people’s faces, the outfits I’m wearing and I feel the joy radiating throughout the room. It’s an amazing experience. The more I prioritize my purpose and callings, the harder I want to work to accomplish them. Whenever I cross a major milestone, I use that as an added push to keep going. Now is the time to get going because it is never too late to become what you were always meant to be. Find your “why” and use it to push yourself past any limitations you think you might have. If it’s truly important you will find a way. If not, then you will find an excuse. Walking in your purpose allows you to inspire and help others to become the absolute best version of themselves, but to do this you need to become the best version of yourself too. This is where stretching comes in. God stretches us so He can mould and shape us into the powerful men and women we are meant to become. When you become comfortable with being uncomfortable, that’s when you can be stretched, moulded and matured as needed. You can see your purpose but never step into it because you’re afraid of doing something new. In her book “Believe Bigger“, Marshawn Evans Daniels speaks about there being five stages on the purpose map. There is the Discovery Stage (where we figure out who or what we think we are), the Talent Stage (where we pick a place to belong in life), the Gap (where God calls us out of our comfort zone), the Gift Stage (where we realize the amazing gifts God gave us) and the Influence Stage (where we understand our divine assignment and create a legacy). OVER 90% OF PEOPLE LIVE AND DIE IN THE TALENT STAGE, TOO AFRAID OF BEING SHIFTED AND TOO COMFORTABLE TO BE MADE UNCOMFORTABLE. To step into our purpose with confidence and be outstanding, we need to become comfortable with being thrust into the unknown. We need to look forward to the adventure that lies in not knowing everything. Lets imagine a few weeks ago when you were preparing to leave your current job so you could fully enter the life God has called you to live, You were incredibly uncomfortable. For two years you had a cushy job with a fairly decent paycheck and lots of time to do whatever the heck you pleased. Fulfilling your purpose meant leaving all that comfort to run yor own business, become a full-time entrepreneur and start speaking in public! What the heck? Did God even know you? God knows that within you lies greatness. For that greatness to come to the surface He needs to push you beyond what you believe you are even capable of accomplishing. If we’re not a little bit uncomfortable every day we are not growing. All of the good stuff lies on the other side of our comfort zone, and it’s time to leave. 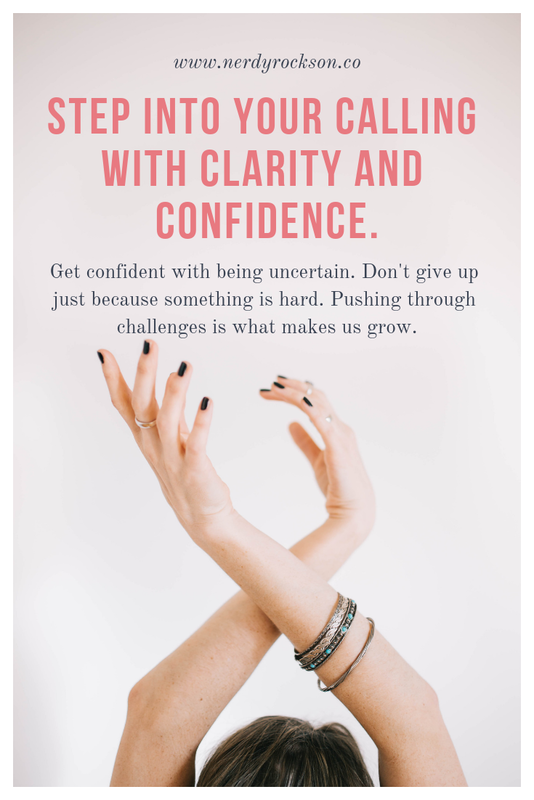 Get confident with being uncertain. Don't give up just because something is hard. Pushing through challenges is what makes us grow. One of the best inspirational quotes I’ve seen in a long time is this: “In order to strive for a remarkable life, you have to decide you want one“. The same goes for your Christian Walk. To be able to step into your purpose with confidence and clarity we need to decide to do so. I said it earlier and I’ll say it again. Everything in our lives starts with a decision. There’s a popular quote that tells us that the journey of a thousand miles starts with one step. If those steps are shaky then it’ll take you longer to get to your destination, or you might never get there at all. Believe in the power that God has given you and walk with confidence. Adopt a mindset for success, learn how to leverage your strengths, squash those automatic negative thoughts, motivate yourself on a daily basis and get very comfortable with being uncomfortable. Your life isn’t meant for you to skirt around your divine purpose but never actually enter it. You are meant to fulfil your destiny, impact the world and serve others at the highest level possible. 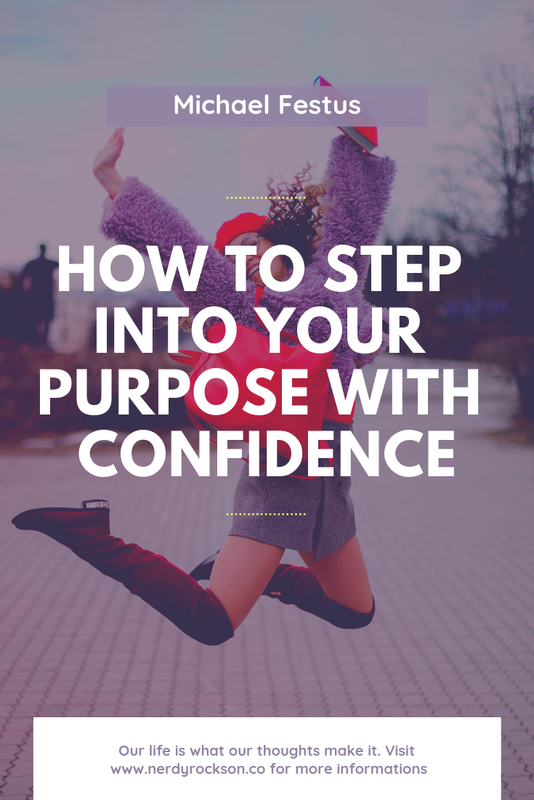 If you enjoyed reading about how to step into your purpose with confidence, you would enjoy reading more about 5 Clear Reasons To Stop Caring What Others Think. I WANT TO HEAR YOUR OPINION. DO YOU THINK YOU ARE LIVING A PURPOSE-DRIVEN LIFE RIGHT NOW?